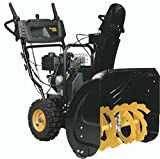 Poulan PRO PR241ES 24-Inch 208cc Two Stage Electric Start Snow thrower -961920092. The Poulan Pro PR241ES two stage snow thrower features a 208cc Poulan Pro engine, electric start, 24-inch clearing path, 23-inch in-take height, improved performance ribbon augers, 180 degree remote chute rotation with remote deflector, 12-inch auger diameter, 13-inch tires, comfort grip loop handles with single hand control, and adjustable handle height. Speeds are 6 Forward and 1 Reverse. 2 Year Limited Warranty and 4 Year Engine Warranty.